Crufts is an exciting time of year for all dog owners and lovers. As a competitor it is the agility that really catches my eye. Ever since I was young I watched the agility on the TV and said, “I want to do that one day”. As I’ve got older and wiser I now start to notice the slips on the carpet, the lack of rubber and the bouncy seesaw, however lets not dwell on the bad. Shopping is a big part of Crufts. Toys, treats, equipment and clothing. 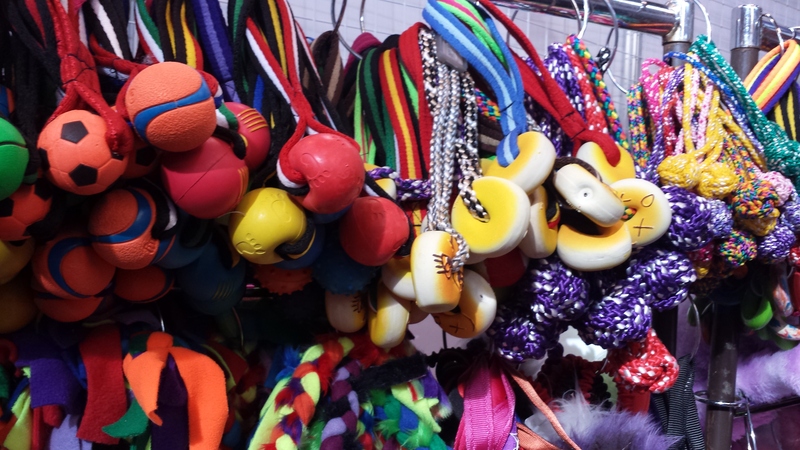 You can buy any sort of toy at Crufts! Cage balls, tennis balls, fleece, stuffed animals, fur, you name it. My ideal agility toy is something on a bungee tug that is high value. Voila, I found a tennis ball on a bungee! Perfecto. There were a few stalls selling garden agility equipment, easy put together jumps, hoops, tunnels and weaves. They’re ideal for having a bit of fun with your dog which is the perfect way to introduce agility to pet dog owners. Health equipment is also growing in popularity and promotion of health products and activities were seen throughout the show. Hydrotherapy, herbal supplements, tablets for joints, digestion, you name it and you can find something which “helps”. Plus peanuts, balance cushions and fitpaws! The DogBooksOnline.co.uk store left me quite confused! There was a huge choice of agility books to buy, including course diagrams and training exercises. I really didn’t know which to choose so I played it safe and left them all! 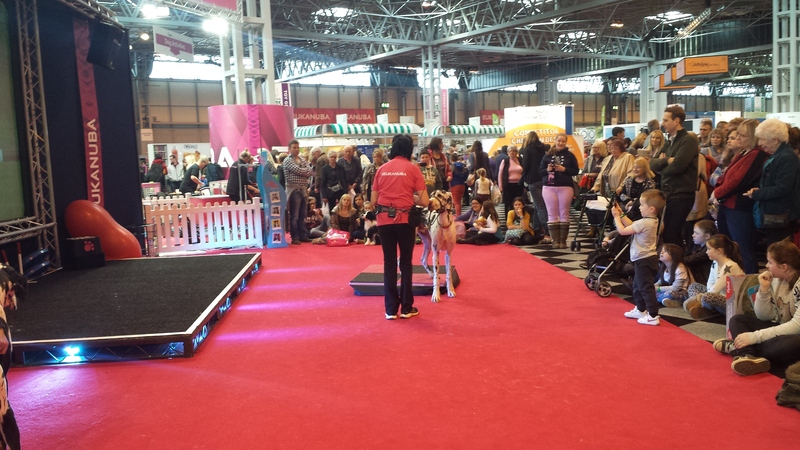 What really caught my eye was the Halequin Agility demo on the Eukanuba stall. I arrived just in time as a lovely lady with a great dane was demonstrating wobble cushions and the exercises to do on them with your dog. She talked about muscles and strengthening exercises and was really enthusiastic about keeping dogs fit. It was brilliant to see and I hope it wasn’t just me that thought so. It’s so enlightening to see more and more health and fitness demonstrations appearing. I challenge you to go away from Crufts without learning something new, no matter how knowledgeable you think you are! The Kennel Club have a big activities section with a little box full of people to answer your questions on agility, as well as free handouts. The activities ring also held some agility demonstrations throughout the day. I was most interested to see Agility1st there! Set up by former KC International Team Coach, Steve Croxford, and current KC GB Team Manager, Mark Laker, Agility1st is a training and accreditation scheme for Agility instructors and coaches. It not only offers you a chance to be recognised and proven as an agility instructor it also offers you training and improvement opportunities! This is the first Agility specific dog training scheme that I have come across and I think it is a hugely positive step forward for agility! (Unfortunately I didn’t get chance to speak to them). Into the main arena and this is where the magic happens! I could sit in there all day (at least until the Group judging starts perhaps). 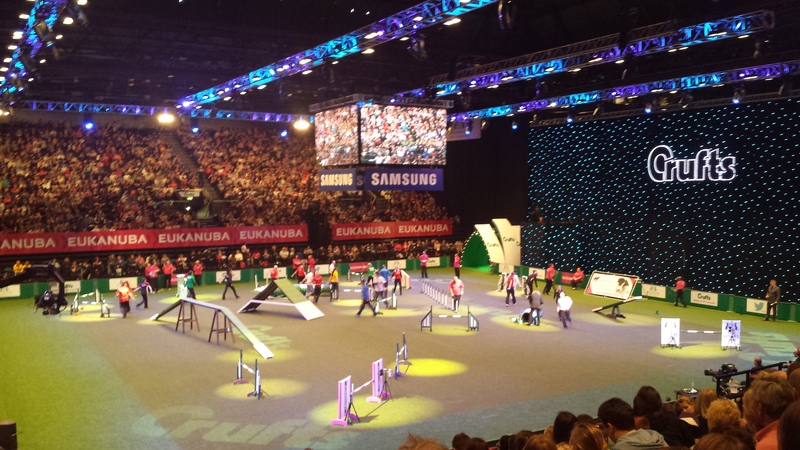 There are plenty of big competitions held at Crufts and its one of the sought after goals for many agility careers. Novice, ABC, International and Championship classes allows for a wide variety of people to get their chance in the limelight. I really enjoyed the courses this year (apart from a few contacts-into-nowhere) and they all ran fast and flowing! There seemed to be less slips and skids than I’ve seen before (maybe due to course design or the dogs being more prepared) and there was some tight competition! The crowd love the agility and there was one person behind me in particular that was squealing, gasping and whooping! I love hearing other people’s enthusiasm. My friends and I enjoying watching the decisions made by competitors, talking about what we would have done and discussing the different international handling styles and methods. Plus the best thing is you can go home and watch all again on youtube! Crufts is becoming more and more diverse and I feel that the attention is starting to creep away from the show dogs a little. Of course it will always be the biggest and most prestigious dog show in the World, however you can certainly enjoy a visit even if you have grubby farm collies at home and no interest in hairspray for dogs. I went home full of ideas for my agility classes, motivation and inspiration to work on my own training and my purse was much lighter! A great weekend!